Your contributions would be greatly appreciated and will be fully acknowledged. While we provide some local history below, additional resources can be found here for Mangere Mountain (also try this link); and Onehunga. Manukau Libraries have put local history online. [Manukau's Journey] is a timeline of historical events, and a fantastic resource. A search for "Mangere Bridge" showed 24 facts, going back as far as 1848. 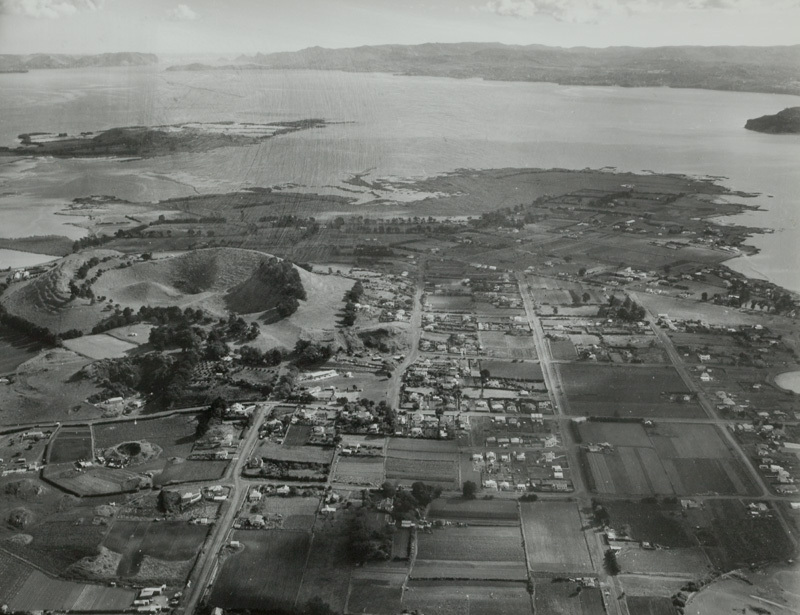 Click [here] for an aerial photograph of Mangere Bridge and Mangere Mountain, dated April 1951. Good sources for general history are NZ History, and the Dictionary of NZ Biography. The [New Zealand National Register of Archives and Manuscripts] (Te Raarangi Puuranga, Tuhinga Ake o te Motu - NRAM) contains "...information about archival collections held in museums, local government bodies, libraries, historical societies, community repositories, and in-house business, educational, religious and sporting archives throughout New Zealand...". St James Church is the only surviving stone church from the Selwyn period. Stones used for building were taken from Mangere Mountain, and brought down by cart or on workers backs. Due to the difficulty of stone construction, the channel arch end relieving arches over the doors and windows are constructed with brick. Governor Grey granted the land in 1849 and 10 years later the church was completed. The vicar of St Peters in Onehunga, Dr Purchas, designed the church, and a gift from bishop Selwyn was the start of the fund to construct it. Rev Mr Robert Barrows, Secretary of the Church Missionary Society, supervised the building by local Maori. An old graveyard next to the church contains the graves of many local Maori and Europeans. Further information on St James Church can be found on their [web site] (Source: Mangere Bridge Chronicle, 19 February 1983). In 1841 John Logan Campbell built a cottage in Brighton Road, Parnell, similar in design to Acacia Cottage (Cornwall Park). During the 1860s the cottage was moved to Mangere Bridge (Church Road) where a 2-storey section was added on one side. In 1970 the original cottage part of the house was destroyed by fire. It was later rebuilt to original specification using demolition timber, closely resembling the original nature of the old building (Source: Mangere Bridge Chronicle, 19 February 1983). Located at Ambury Road, Waterlea was built in 1885 by J.E. Taylor, a civil engineer. The architectural significance of this building is the early use of poured concrete as a structural material, which also extends to a concrete barn. Taylor was one of the first designers of a canal proposed to join the Manukau Harbour and the Tamaki River. He made test bores along the route, and considered the tidal movements between the two harbours could be harnessed to generate electricity. The property has an extensive gateway, and can be seen from Ambury Road. It was previously owned by former Prime Minister David Lange (Source: Mangere Bridge Chronicle, 19 February 1983). The Manukau Yacht and Motor Boat Club (MYMBC) has a long and rich history, dating back to 1891. The Club is the second oldest yacht club in Auckland, and the third oldest in New Zealand (after the Royal NZ Yacht Squadron, Auckland and the Royal Port Nicholson Yacht Club in Wellington. Its history is reflected in the honours board in the Club house, and a large number of photos, plaques and cups on display. It still has an active racing/cruising programme, and runs a junior "Learning to sail" programme. For more details on its history, use this [link]. One of many volcanoes in Auckland, Mangere Mountain erupted about 18,000 years ago. Lava bombs are still visible on the mountain, and lava flows can be seen in the Manukau Harbour, and Ambury Park. The mountain hosts two craters, and a range of terraces and pits. Access to the summit (about 100m high) is easy, and there are 360° panoramic views. A visitors centre has been developed at the old quarry site on Coronation Road, providing a range of educational activities. Check out their website (Source: Discover Mangere Mountain, Manukau Parks brochure). The Otuataua Stonefield is a 100 ha reserve, established to preserve archaeological remains of Maori and European durable stone structures, dating back up to 800 years. Still visible today are cooking areas, storage pits, garden mounds, and terraces. For some photos, click [here]. The area is also geologically fascinating due to a range of small and complex volcanic cones, resembling a miniature volcanic field. At a botanical level, rare fragments of indigenous coastal forest can still be found. There are a range of self-guided walks (Source: The Otuataua Stonefields Historic Reserve, Manukau City Council Commemorative Brochure).